Methods and practice for the impact evaluation of policy-oriented research (POR) lag behind many other research sectors, such as agricultural technology research, making it difficult to prioritize investments in POR and retarding institutional learning about how to make POR more effective. To address these issues within the context of CGIAR, a workshop on “Best Practice Methods for Assessing the Impact of Policy-Oriented Research” was cosponsored by the International Food Policy Research Institute (IFPRI), the CGIAR Research Program on Policies, Institutions, and Markets (PIM), and the Standing Panel for Impact Assessment (SPIA) of the CGIAR’s Independent Science and Partnership Council (ISPC), and held at IFPRI headquarters in Washington, DC, on November 11–12, 2014. 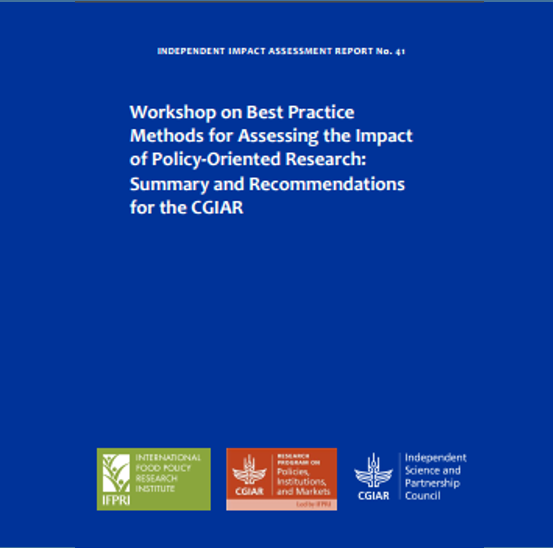 This paper provides a summary of the workshop discussions and draws on this, together with findings from the literature, to derive guidelines for assessing policy-oriented research in CGIAR.